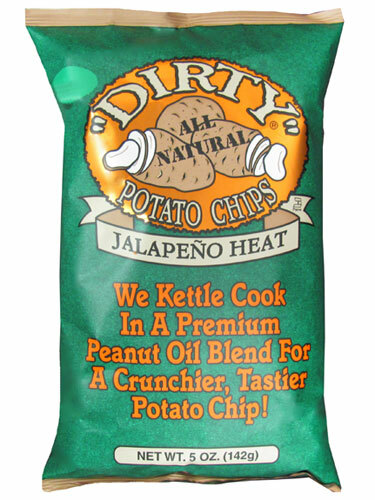 Dirty clearly say, "We Kettle Cook In A Premium Peanut Oil For A Crunchier, Tastier Potato Chip", and they plaster it all over the front of their bag. Brilliant. It takes some real marketing courage to go for an original approach like this, and we applaud them for it. The Bags are flavor color coded, which is also the modern and correct way of differentiating the Chips flavors. This metallic green color is not too great, but that is a minor point. We would also like the actual flavor to be more prominent than the company logo. A thick and firm bite type crunch rather than a crispy snappy crunch. To eat through a bag of these gives a good jaw work out and a noisy in mouth cacophony. The 'Dirty' nature of these Chips was emphasised by the natural, unpeeled look and feel. There was oil visible, but much of it was hidden by a great amount of seasoning. You can shake a Chip and residue and tiny bits of Chip fly everywhere. The oil bubbles were minimal, but the Chips were thick and firm, with some really curly bag members. To explain 'Dirty' it means the potatoes are not washed, which in turn means the starch stays within. This leads to some natural salt flavoring, to which Dirty's have added additional salt which sightly overwhelmed the pepper flavor. There is heat, and at times the random seasoning ensured that there can be significant sweet Jalapeno Heat, but the balance veered slightly towards a little too salty.